Homework - ZineWiki - the history and culture of zines, independent media and the small press. Homework (No.1) is a publication by Patrick Rieve and was released in June/July 2006. Subject matter of the publication is a series of drawings by Patrick Rieve with the same title. The publication was published on the occasion of the exhibition "Reality in general is almost unavoidable" at Neue Berliner Kunstverein (n.b.k.) in Berlin, 2006. The pages are part of the exhibition's catalog and the publication was realized by producing an overprint. Size of the publication is 15 cm x 21 cm. It is offset-printed. The publication consists of 16 pages and presents the Homework series only to some extent. Rieve continued to work on these drawings between 2005-2007. "The intention behind my Homework, a series of drawings and collages in which I record and analyse my habitat from different points of view, is to dismantle in this manner the house in which I live with friends. I make use of architectural drawings, isometric explosion drawings, and echoes of comic strip artists (such as Chris Ware and Charles Burns) to gain insights and overviews and to approximate the idea of a comprehensive perception of space. Ground plans and elevations including the entire furnishings, collage-like compilations of textual components from various contexts, the copied cover of a locked room mystery, vanitas motifs, and feng shui applications are multiply extended — by means of allusively formulated, sleuth-like questionings — towards locating my own position within these contexts, or towards sketching my personal search for that location. One drawing comprises a book title — Every Day Holodeck — as a detail. Other sheets show parts of corpses, as in a Tibetan air burial, that lie matter-of-factly among the furniture, an allusion to “settling down” or just “being at home” being a perpetually fragile state and never more than transient. Not even by ordering and designing space according to feng shui doctrines can this instability be transcended. Field of vision drawings reveal nothing about the subject peering through the eye sockets. Even when all the clues have been followed up, the case is not closed. But as it is found in another picture’s bathroom mirror, scrawled in the slime letterpress of the 1960s B movie of the same title: “Whatever it is, it’s alive!”"
Related articles: Justice Traps the Guilty, Ace of Space and Adventures into the Unknown. 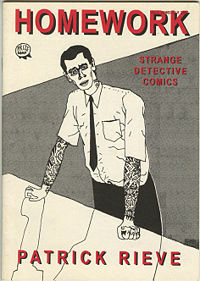 The publication is included in the collection of the St. Patrick's Zine Library. This page was last modified on 21 November 2013, at 09:56. This page has been accessed 3,111 times.